You and your family huddle together in blankets, shivering something fierce. Maybe you even see your breath. The heat doesn’t work properly and you’re at the whims of your negligent landlord to make repairs. So, in order to try to protect your family, you turn on the oven and open its door. Heat eventually starts to pour out. That does the trick. Or, maybe you went out and bought space heaters and have them plugged in all over the apartment. It’s not the best thing, but it works. No more freeze. Half of home heating fires are reported during the winter months of December, January, and February, according to the National Fire Protection Association. Only now you’re at risk of a devastating fire accident and the potential burn injuries and loss of property that comes with it. According to the National Fire Protection Association, in 2015, the most recent year for which there’s data, 95,000 fires broke out in apartment buildings, causing 3,025 injuries, and 405 deaths. It shouldn’t have to be this way. There are laws and regulations — especially if you’re living in Section 8 housing — that are supposed to make sure you don’t have to risk your life just to keep your family warm. But when a landlord isn’t following the rules, what are you supposed to do? In light of National Burn Awareness Week, Morgan & Morgan is highlighting some key things you should and shouldn’t do when faced with enduring a living space without heat that works correctly. Is your apartment safe? Download our Fire Safety Checklist to learn the steps you can take to prevent fires. One important step in the process is reporting your situation to your landlord. It probably sounds weird to report your problem to the person or company that might be the cause of your trouble, but it’s an important step. “Make sure there’s a paper trail with management,” says Morgan & Morgan fire attorney Ben Wilson. Although your landlord might not seem to care that your heat isn’t working, if something happens down the road you will still want to be able to show that you reported the problem and made efforts to put your landlord on notice. It’s tempting to use the oven to heat a cold apartment. It seems safe — after all, the appliance probably works the same whether or not there’s a roast in the oven. Right? Things aren’t what they seem, though. It’s an extreme fire hazard to heat your home with your oven. It could also cause potentially fatal carbon monoxide exposure, according to the U.S. Centers for Disease Control. The temptation to use an oven isn’t exclusive to tenants. Wilson, who has helped fire victims win millions of dollars for their suffering, says he has had a client for whom the oven was the recommended heating substitute. Space heaters are both perfectly useful and supremely dangerous. They aren’t always a bad option to heat your home if your normal heating method isn’t working — or isn’t working enough. It’s just that they require you to be careful with how and where you use them. For starters, make sure you buy space heaters with built-in cut-off mechanisms that turn off the unit upon tipping, according to Wilson. As you’re placing the heater or heaters in your home, make sure they are at least three feet away from anything that can burn, according to Wilson. Some of the most flammable items in a home include upholstered furniture, clothing, mattresses, and bedding. Loading your home with space heaters that are too close to flammables could put you at extraordinary risk for an accidetanal fire. Between 2011 and 2015, the latest year with data, heating equipment was involved in about 54,000 reported U.S. home structure fires, resulting in 480 deaths and 1,470 injured, and $1.1 billion in property damage, according to the NFPA. Another important thing: Don’t forget to turn off the heaters before bed. It goes against the idea of a cozy night of sleep, to be sure, but unattended space heaters could start fires. It’s better to be safe. Too many space heaters, when used at the same time as other electronic items or all on the same outlet or area, can pose another risk: electrical fires, which the NFPA says account for more than 50,000 home fires every year. Outdated electrical systems are a major hazard, because they can’t keep up with the power-hungry devices and appliances. Usually, overloading electrical circuits in your home will trigger the circuit-breaker, but it’s not something that regularly happens. If your wiring is aging and can’t handle the load, it could trip your circuit breakers more often and, over time, start a fire before the breakers can trip. Another obligation your landlord likely has to you is to provide and maintain fire safety equipment like fire extinguishers and smoke detectors. There are usually specific requirements for the placement of fire extinguishers. Furthermore, they are generally required to be inspected and serviced once a year — they can lose pressure over time. With adequate fire safety measures, that means you could be properly using space-heater equipment and it could still start a fire, but at least there would be measures to put out the fires and keep people safe. In theory, anyway. All fire extinguishers should have a tag reporting when they were last serviced. It’s obvious, then, if the landlord isn’t doing what they should be doing. What if there’s no tag? That’s bad, Wilson says. “If the fire extinguisher is missing a tag, that’s a good sign that there’s a problem,” he says. 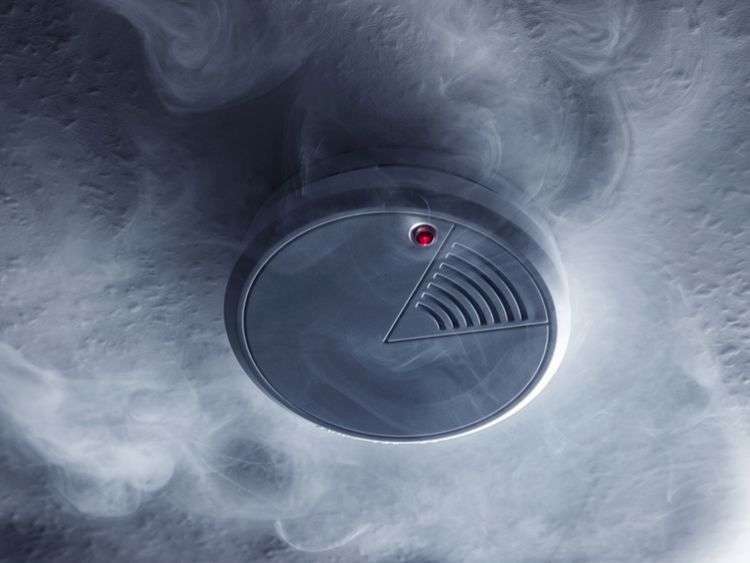 Also, make sure smoke alarms are mounted correctly and powered — the standard is hard-wired plus a battery backup. But they shouldn’t be too old — detectors have a shelf life and if they’re several years old even a new battery won’t help them do their job. There also needs to be enough smoke alarms for an entire home — you can’t just have one in the hallway outside the kitchen. Each bedroom should have one, for example. Check with the requirements for your area and/or housing complex for specifics. But What Happens if There Is a Fire? Sometimes all that stands in the way of fire injury and a safe home is the landlord bothering to actually keep you safe, according to Morgan & Morgan fire injury attorney Rocky Wilkins. “I have handled hundreds of burn cases at apartment complexes and almost every single one could have been prevented if the landlord cared enough to spend a little money on the front end for things like fire extinguishers and regular fire safety inspections,” Wilkins said. If you or someone you love were injured in a fire, even if you think it was your fault, you might want to hire a fire and burn injury lawyer. Fire and burn injuries could mean huge medical bills, life-altering injuries, and even death. You and your family shouldn’t be stuck dealing with your trauma without an experienced advocate by your side. Contact us today for a free, no-risk case evaluation. We’re here to help.